Suge J Knight even boasted that he was working on new music with the legendary rapper and actor in the studio - despite accounts of Tupac's death following a drive-by shooting in September of 1996. 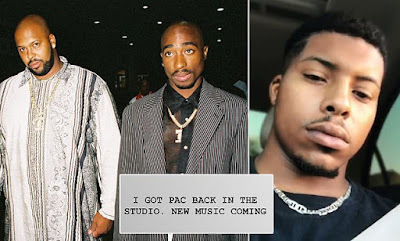 Knight made the bizarre statements on his personal Instagram account over the past several days, after first sounding the alarm that Tupac was living in Malaysiain October. Knight is the son of Marion Hugh Knight Jr., also known as 'Suge Knight,' who was the founder and former CEO of Death Row Records.